Magic Trixie has a problem; everyone loves her baby sister, Abby Cadabra, and no one is paying attention to Magic Trixie! On top of that, she has to come up with a “wow” for show and tell day at Monstersorri School to impress her friends; Loupe Garou, the sassy werewolf girl; Stitch Patch, the sweet Frankenstein’s monster; and Nefi, the beautiful mummy girl. When Magic Trixie finds a way to fix both problems at once, she learns that sometimes a change in attitude is the best remedy. From the candy-hued watercolors, to the adorable characters, to the sweet and witty story, MAGIC TRIXIE is a delight all around. Magic Trixie herself is a very bright, mischievous bundle of energy with a knack for getting in trouble and her friends are cute, cuddly takes on classic monsters with personalities that could easily belong to real, live children. The adult characters feel so real that I wonder if Thompson modeled them on her own friends and family. Young readers will relate to the relationships and family dynamics in the story and laugh out loud at the craziness. Thompson’s watercolors are truly stunning; she’s a master at mixing words and pictures seamlessly into a compelling story. I can’t recommend MAGIC TRIXIE highly enough – it’s jumped straight into my top ten all-ages comics of all time. 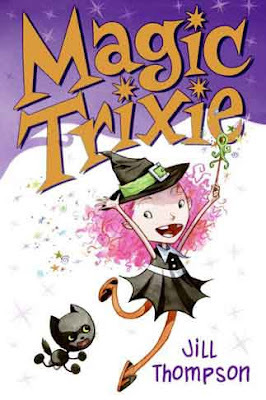 Sarah (age 10, grade 6) says: MAGIC TRIXIE is really super, awesomely cute and funny and has a good story. I think Magic Trixie is kind of like a magical JUNIE B. JONES. Everybody would really like MAGIC TRIXIE because it’s funny and everyone will get it and the story is simple and easy to understand, and the art is bold, colorful, and very detailed. Shelby (age 13, grade 8) says: This is probably the most colorful book I have ever seen in the world! All the art is watercolor and that is a really hard medium to use because you can’t fix anything if you mess up, but Jill is a master. Everything looks so realistic, yet it’s still cartoony and adorable beyond words. My friends will pretend it’s dumb because it’s cute, but I think everyone will like it, even if they won’t admit it. Elementary-aged kids will relate to Magic Trixie’s antics, her relationships with her friends, and the sometimes complicated relationships in her family. MAGIC TRIXIE would be an excellent starting point for a social studies discussion of different types of families and relationships. This is the first book in a series; MAGIC TRIXIE SLEEPS OVER and MAGIC TRIXIE AND THE DRAGON are equally as wonderful. For students (and teachers!) who fall in love with the character, Magic Trixie has her own blog. The theme of this book revolves around witches and monsters, in the cutest way possible. Though there is nothing frightening, some families may object to the themes. My 4th graders ADORE Magic Trixie!